Image: courtesy of Chinatown Partnership LDC. Group of Chinatown property owners cited concerns about the BID’s assessment formula. On May 26, 2011, the City Council’s Finance Committee held a hearing on the Department of Small Business Services’ plan to create the Chinatown Business Improvement District encompassing more than 6,000 commercial businesses in Manhattan’s Chinatown. The BID would comprise 50 blocks generally bounded by Broome Street to the north, Worth and Madison Streets to the south, Allen Street to the east, and Broadway to the west. The BID’s projected first-year budget of $1,300,000 would be used primarily to fund sanitation services and holiday lighting costs. At the City Planning Commission’s hearing on the proposal, a representative of the Chinatown BID Steering Committee testified that 92 percent of commercial and residential property owners supported the plan. After the hearing, however, the Commission received letters from property owners opposed to the BID’s assessment formula. 8 CityLand 42 (April 15, 2011). The Finance Committee’s hearing was held in an over-capacity meeting room, and Chinatown residents and property owners spoke both in support and opposition. Mott Street property owner Jan Lee opposed the BID and claimed that 75 property owners intending to testify at the hearing had been turned away after being told the hearing room was over capacity. Lee testified that the neighborhood had not yet recovered from 9/11, and argued that the BID “tax” would be too burdensome because it would be tied to “ever-increasing” property taxes. Local property owners and representatives from the Chinatown Partnership, Manhattan Community Board 3, and the Lower Manhattan Development Corporation testified in support. Local Council Member Margaret Chin supported the BID, claiming that it would be of benefit to Chinatown and Lower Manhattan. The hearing triggered a 30-day period for affected property owners to file objections to the BID with the City Clerk. 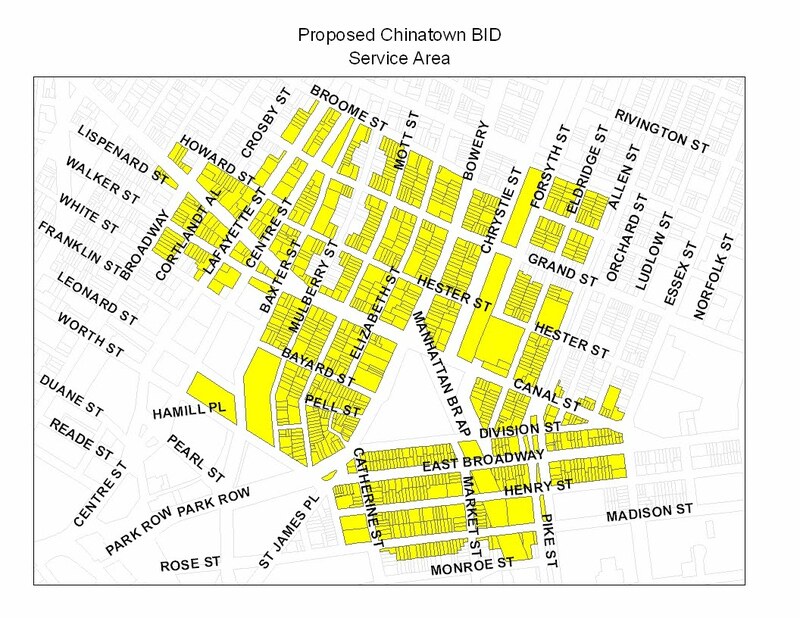 The Chinatown BID would be the City’s 66th if approved by the Council and the Mayor. Council: Chinatown BID (May 26, 2011).